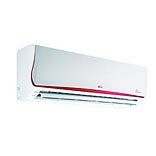 LG Electronics is aiming for a 25 per cent growth in its revenue from the air- conditioning business. In addition, this Korea-based player is targeting a 10 per cent growth in its industrial cooling segment and that would be largely driven by increased demand from pharmaceutical and retail clients. Saurabh Baishakhia, Business Head -Air Conditioners, LG India, said, "We expect revenue of Rs 2,500 crore from the domestic air-conditioning segment, this year, and it would be a 20 - 25 per cent year-on-year increase."